Founded: 1974, Now a server division of Hewlett Packard. 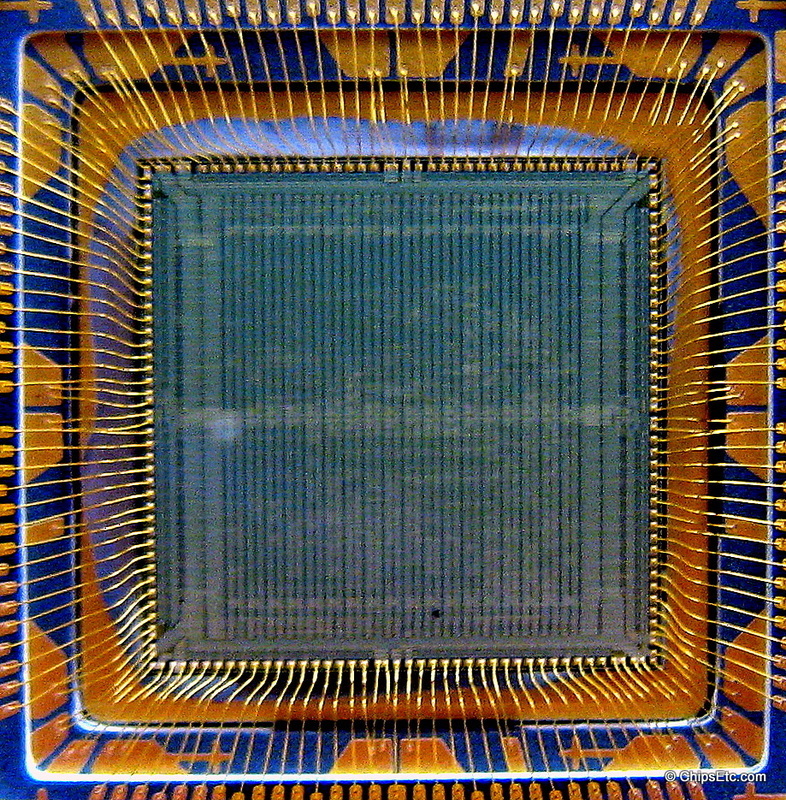 Specialty: Leading manufacturer of fault-tolerant, mission critical, mainframe computer systems for ATM networks, banks, stock exchanges, telephone switching centers, and other commercial transaction processing applications requiring maximum up-time and zero data loss. Created the Tandem T/16 - worlds first fault-tolerant computer, & the Nonstop Himalaya & Cyclone series computers. 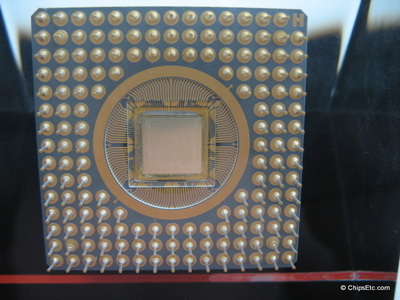 Paperweight contains a Tandem Computers MIPS based RISC processor embedded in Lucite. 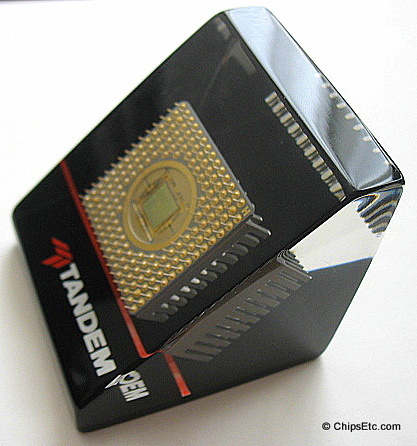 Starting in 1991, Tandem Computers started using single chip MIPS RISC Microprocessors to power their fault tolerant computer systems. 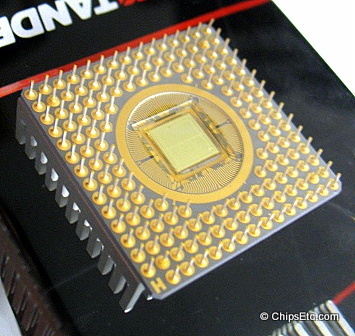 Before this, they were using CPU's that were composed of multiple PCB boards that contained an array of individual logic & memory chips as wells as other discrete electronic components. 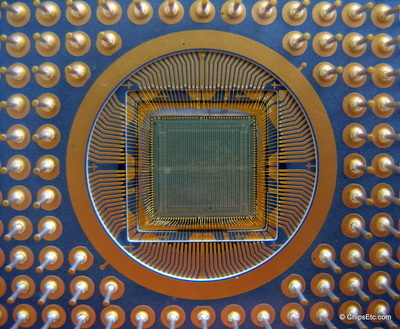 This MIPS chip is mounted in a PGA (Pin Grid Array) Ceramic package with 155 gold-plagted pins. 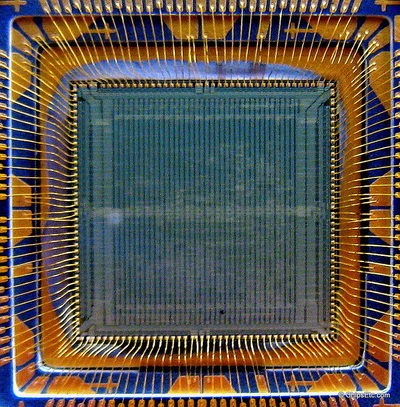 The underside cap has been removed in order to allow viewing of the silicon die and gold wire bonding. 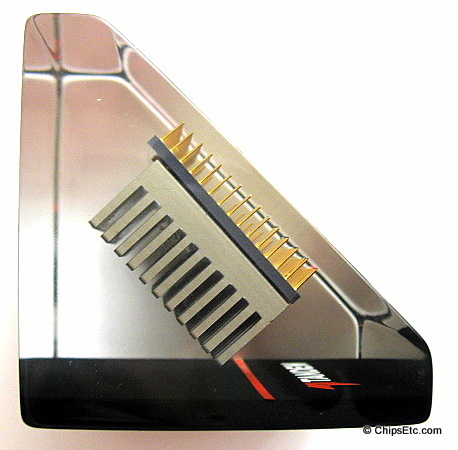 On the top side of the chip's package is a finned aluminum heat-sink for air-cooling. 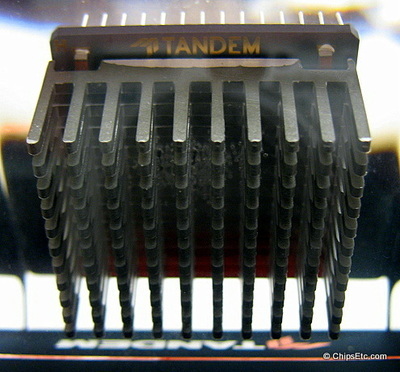 The processor is marked "Tandem" on it's topside near the heatsink. Tandem Computers mainframes used multiple (from 2 to 16) processors in their systems to insure a high level of fault tolerance (Later systems could have up to 4000 CPU's). If any one of the processors failed then the operating system automatically shifted it's workload to the other processors. 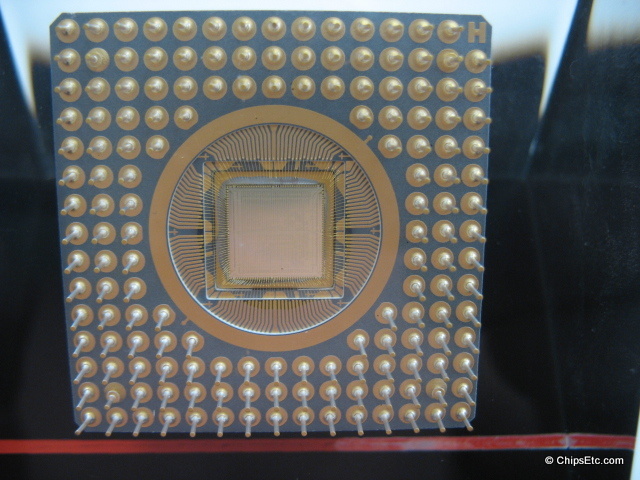 Each processor had it's own private memory, I/O processor, and copy of the operating system microcode in it to allow for advanced fault isolation. 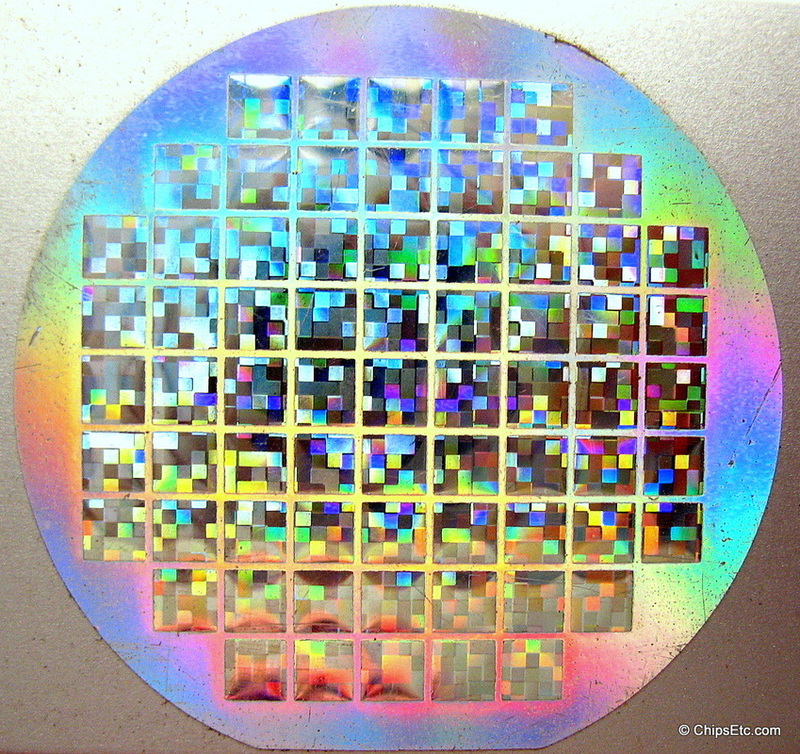 Aluminum paperweight from Tandem Computers features a small holographic replica of a multi-chip Silicon Wafer that would have been the type of memory storage used in their V90 mass storage system. 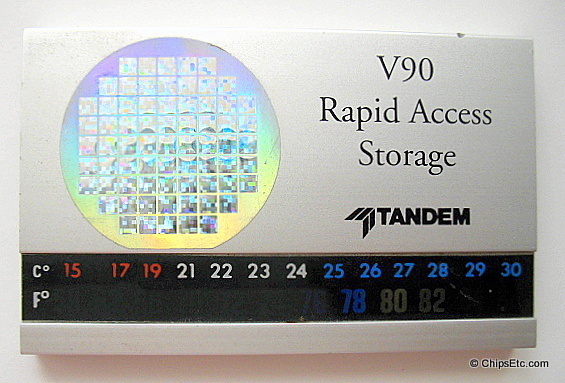 The V90 Rapid Access Storage subsystem was the computer industry's first commercial solid-state storage subsystem based on whole-wafer memory technology. 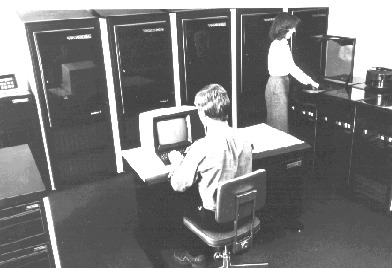 It was designed to be used with Tandem Computer's high-end NonStop Cyclone mainframe computer systems. The V90 storage subsystem used memory technology designed by Anamartic Ltd. and was fabricated by Fujitsu. 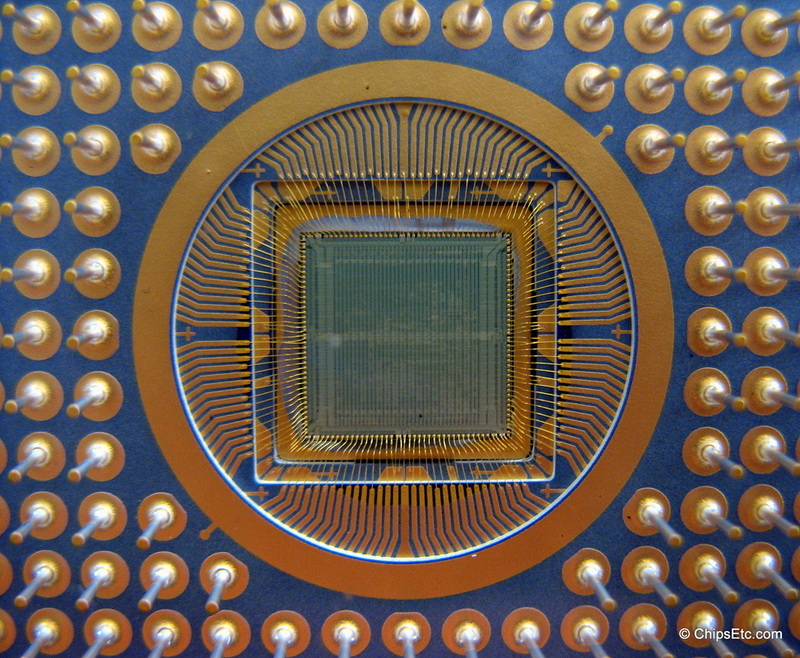 The memory was constructed from an entire, uncut Silicon wafer with circuitry designed to detect and route around faulty cells. At the bottom of this desktop paperweight is a temperature strip for showing room temperature.